Scientists have completed the first comprehensive assessment of UV-filters in surface seawater, sediment, and coral tissue from multiple coral reefs around the island of Oahu, Hawaii. UV-filters are active ingredients in sunscreens, but are also added to many other products, including textile, plastics, and paint to prevent photo degradation. The UV-filters oxybenzone and octinoxate have received attention by policy makers regarding their potential impact on corals. The research will help provide a baseline for future risk assessments. Globally corals are in serious decline with major threats from increasing temperatures due to climate change and disease. New threats from chemical contaminants in seawater are an emerging area of concern, particularly near coral reef areas with high-density population, tourism, or recreational activities. The detection of sunscreen active ingredients (i.e., UV-filters) in the aquatic environment has raised concerns over potential adverse impacts on coral reefs. However, there is very limited scientific data on their environmental concentrations in seawater near coral reefs in Hawaii. To help address these data deficiencies, University of Maryland Center for Environmental Science and University of Maryland, Baltimore County researchers measured the concentration of 13 UV filters, including oxybenzone and octinoxate, in seawater, sediment, and coral tissues. Other organic chemicals (e.g., sucralose and surfactants, synthetic hormones and polycyclic aromatic hydrocarbons [PAHs]) were also analyzed in the study. "Our study vastly expands the current body of scientific data needed to assess the environmental risk of these chemicals to corals. This data can be used in conjunction with future toxicological studies to estimate environmental risk to corals and other species," said study lead Carys Mitchelmore of the University of Maryland Center for Environmental Science. Her research expertise focuses on understanding how contaminants and other environmental stressors interact with and impact organisms, especially sensitive species like corals. Study locations were chosen to represent different hypothesized loadings of UV-filters from municipal, recreational, and tourism activities, and included the tourist hot-spot Waikiki Beach and Kaneohe Bay, a popular location for water-based recreational activities. The study is the first to present on the concentration of UV-filters in coral tissue from the U.S.A. and reports the presence of at least 8 different UV-filters in coastal waters, sediment, and coral tissue from Hawaii. The study found low, parts per trillion, seawater concentrations of oxybenzone at the 19 sites studied, with most sites (12 of 19) reporting less than 10 parts per trillion (or 10 ng/L). (One part per trillion is the equivalent of adding 10 drops to a football stadium similar to the Rose Bowl filled with water.) The highest concentrations were found at the places where more people were, with up to 136 parts per trillion found at a Waikiki Beach site. No measured levels of octinoxate were found in any of the seawater samples. "Overall, the impacts of oxybenzone and octinoxate to intact corals occur at much higher concentrations than this study found in seawater near coral reefs. Currently, there are only five studies that have looked at the toxicity of oxybenzone and/or octinoxate to corals, so much more research on the toxicity to corals is needed," said Mitchelmore. The study also shows that surfactant (i.e. detergent) degradation products are in seawater around the reefs, especially at Waikiki Beach, which may also impact corals. "Corals are faced with multiple stressors, and it is challenging to determine which chemicals are at concentrations in the environment that cause harm to the reefs," she said. "We currently face huge challenges to protect our coastal and oceanic ecosystems," said Mitchelmore. "Much more research is needed to determine the risk of UV-filters to corals. Scientists from academia, government, and industry need to work together to conduct additional monitoring and toxicology studies so that management and policy decisions can determine what are the priority stressors and contaminants of concern most damaging to reefs." The paper "Occurrence and distribution of UV-filters and other anthropogenic contaminants in coastal surface water, sediment, and coral tissue from Hawaii" was recently published in Science of the Total Environment by Carys Mitchelmore, Michael Gonsior, and Andrew Heyes of the University of Maryland Center for Environmental Science and Lee Blaney, Ke He, Ethan Hain and Anna Feerick of University of Maryland, Baltimore County. 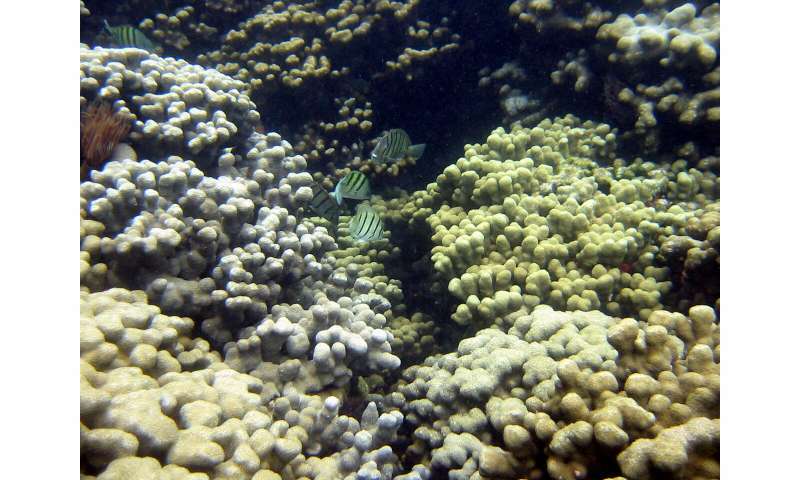 Some sunscreens may kill corals. Should they be banned?